We are opening a Local Artisan Market right here on the farm, to work in conjunction with our glass blowing studio! Just in time for the Holidays! The Market will feature several local artists and fine crafts. 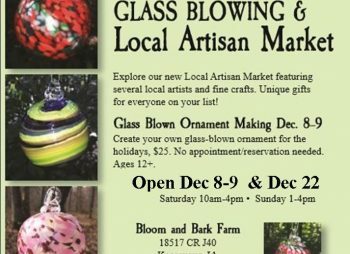 To celebrate the opening of the Local Artisan Market, we will be having Drop-In Glass Blown Ornament Making all day Saturday 12/8 and Sunday 12/9. Stop in and create your glass blown ornament for the holidays. 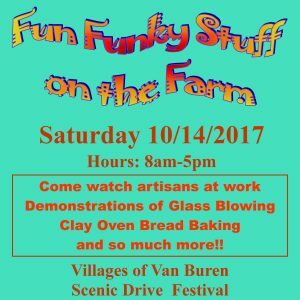 Bloom and Bark Farm & Glass Blowing Studio will be opening up the farm for the Van Buren County Scenic Drive Festival. The weekend long festival is Southeast Iowa’s Largest Arts, Crafts and Flea Market Event! This event pulls in thousands of visitors and covers 11 different communities throughout Van Buren County. 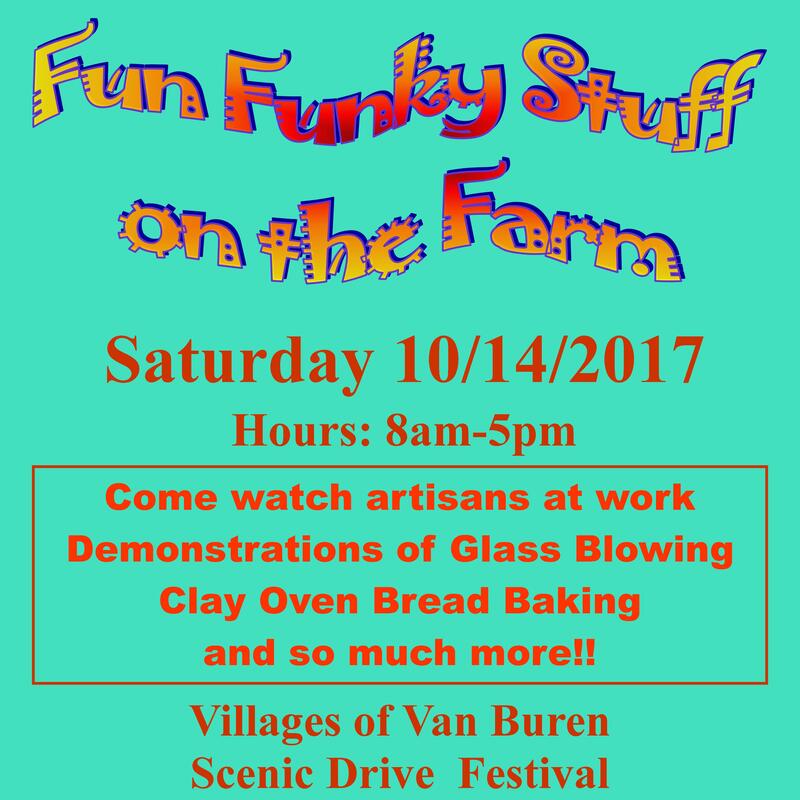 Here on Bloom and Bark Farm we will be demonstrating our hand-crafted clay ovens baking delicious artisan breads and Artist Tim Blair will hold glass blowing demonstrations through out the day. Along with all the demonstrations, Kim will have her famous delectable jams for sale along with lots of other Fun Funky Stuff. For the first time ever Bloom and Bark will be opening up the farm for the Van Buren County Scenic Drive Festival. The weekend long festival is Southeast Iowa’s Largest Arts, Crafts and Flea Market Event! This event pulls in thousands of visitors and covers 11 different communities throughout Van Buren County. 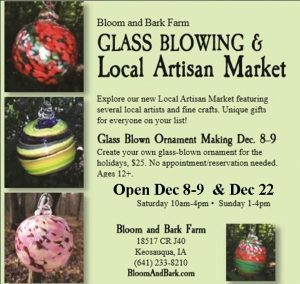 Here on Bloom and Bark Farm we will be demonstrating our hand-crafted clay ovens baking delicious artisan breads and Artist Tim Blair will hold hourly glass blowing demonstrations. 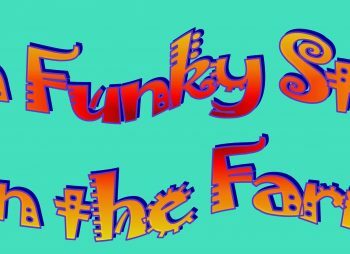 Along with all the demonstrations, Kim will have her famous delectable jams for sale along with lots of other Fun Funky Stuff. A day filled with food, farm tours, wagon rides, local artist, history, wine tasting, hand crafted furniture, live music and so much fun for the whole family! Here at Bloom and Bark Farm you can explore our gardens and greenhouses, see how a hand-crafted clay oven bakes delicious artisan breads, sample fresh produce and bread with a cold glass of mint water. 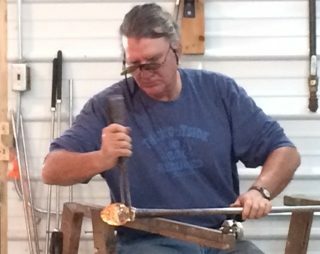 Tour our new Glass Blowing Studio and watch demonstrations by artist Jim Topic. We have been cutting trees and stripping bark for the Hobbit House, so you will get too see some progress on what will be an awesome structure. Crane Winery will be tasting their delicious sweet wines and Dang Dog BBQ will be sampling their amazing sauce both a Bloom and Bark Farm. 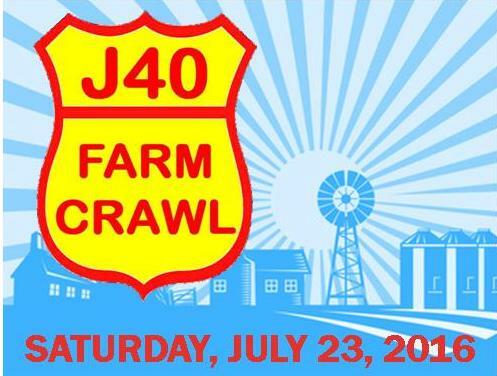 You will also have the opportunity to explore Lengacher’s Greenhouse, Yoder’s Indian Creek Furniture, Koldt Barn, Troy Academy and Milton Creamery. Start the day off with a delicious home cooked breakfast at the Amish School, than wander down the road to explore the 9 different participating farms, businesses, and museum along the route. At Pittsburg General Store you will meet and observe artist Bob Norman, Iowa’s only formally train oil painting conservator. At Bloom and Bark Farm you can explore our gardens and greenhouses, see how a hand-crafted clay oven bakes delicious artisan breads, sample fresh produce and bread with a cold glass of mint water. 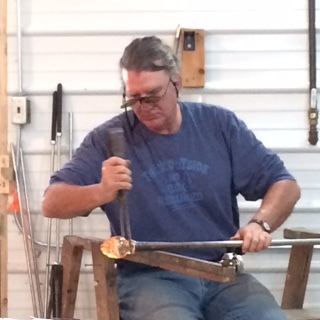 Tour our new Glass Blowing Studio and watch demonstrations by artist Jim Topic. Then check out the progress we have made with our hand built Hobbit House. 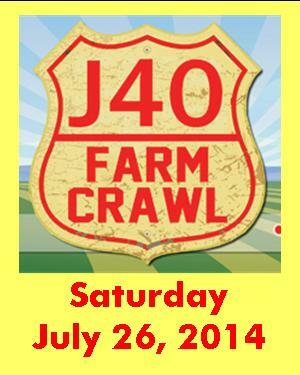 Live music from 2pm-4pm by the Fairtown Ramblers. Crane Winery will be tasting their delicious sweet wines and Dang Dag BBQ will be sampling their amazing sauce both a Bloom and Bark Farm. At Lengacher’s Greenhouse horse-drawn wagon rides will take you through out their farm, where you will see bounties of beautiful mums and fresh produce. 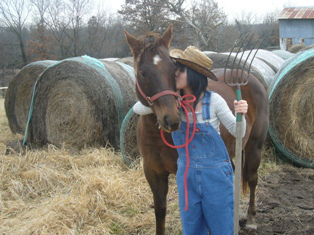 Amish School will be serving a delicious homemade breakfast complete with biscuits & gravy and pancakes and sausage. Free will donations will be accepted. Yoder’s Indian Creek Furniture will have their show room full of beautiful hand-crafted hardwood furniture along with discounts on poly furniture. In addition to all the eye catching beauty, your taste buds will be enticed with free homemade ice cream. The Troy Academy, the first institution of higher education west of the Mississippi, will be open for guided tours. Milton Creamery will be open all day sampling their award winning cheese made from the milk of local Amish farms. Start the day off with a delicious home cooked breakfast at the Amish School, than wander down the road to explore. At Bloom and Bark Farm you can explore our gardens and greenhouses, see how a hand-crafted clay oven bakes delicious artisan breads, sample fresh produce and bread with a cold glass of mint water. Then check out the progress we have made with our hand built Hobbit House. 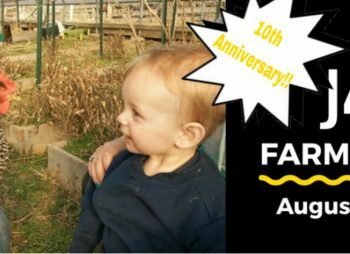 A day filled with food, farm tours, wagon rides, local artist, history, wine tasting, hand crafted furniture and so much fun for the whole family! 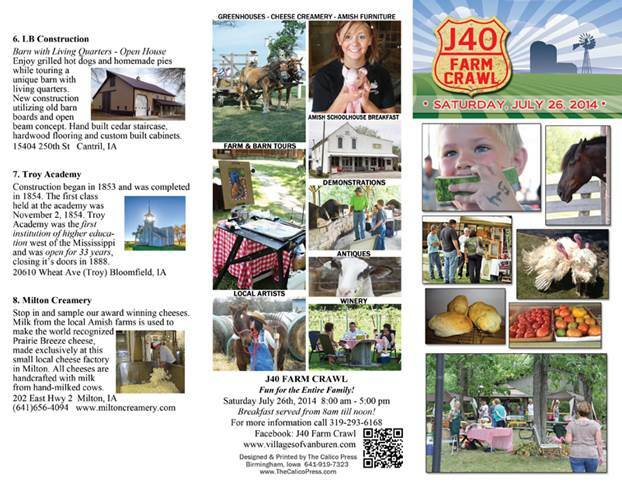 Discover the great products and services offered by small family-owned farms and businesses along Highway J40 from Pittsburg to Lebanon and Beyond in the scenic Villages of Van Buren County in Southeast Iowa! 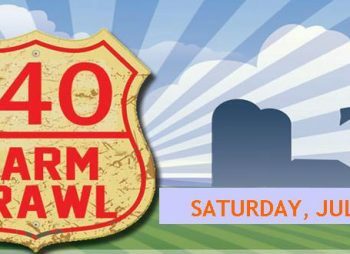 This is a weekend of great fun, filled with Farm Tours, Amish School Benefit Breakfast, Local Artist, Amish Furniture Store, Greenhouses, Wineries, Artisan Bread & Cheese, Wagon Rides. 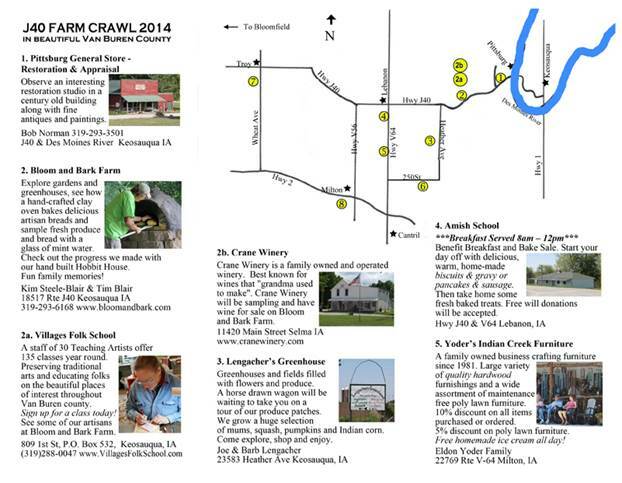 A wonderful opportunity to explore 9 different farms and business all within a 17 mile radius. The weekend event opens Saturday, July 20 with a homemade breakfast of Biscuits, Gravy, Pancakes and Sausage at the Lebanon Amish School from 8:00 a.m. to 12:00 p.m. (Free-will donation.) Meander down the roads to shop for antiques and art, tour farms and taste wine and cheese. Take a ride on a horse-drawn wagon, take home quality handcrafted hardwood furniture and purchase fresh produce, wine, flowers, fresh baked artisan bread, dog treats and award winning cheese. Learn how to bake bread in an outdoor clay oven. The twelve farms participating Saturday 8am-5pm are: Pittsburg General Store Art Studio, Bloom and Bark Farm & Dog Bakery, Villages Folk School, Crane Winery, Whispering Pines Winery, Lengacher’s Greenhouse, Amish School, Yoder’s Indian Creek Furniture, Richardson’s Point, Klodt Barn, Troy Academy, and Milton Creamery. 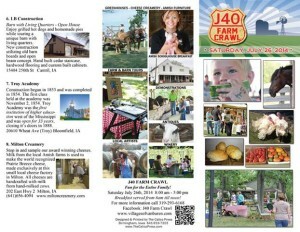 For more information about the J40 Farm Crawl 2013 see the contact information below.